I wonder if it’s coincidence that Togashi called this chapter “Departure”? That’s certainly a name that’s now forever linked with Hunter X Hunter, though it’s undeniably a fitting title for the chapter itself. Volume 33 of the manga easily breezed past the million mark in its third week of sales, proving that this series hasn’t lost so much as a fraction of its popularity and commercial clout. And with Vol. 34 mostly build around the Hisoka-Chrollo Bowl, that volume seems likely to be an even bigger seller. If you’re a fan of Hunter X Hunter, death has been a regular companion since the “York Shin” arc (that’s when widespread carnage really became the norm) and after a brief lull at the start of “Dark Continent”, the body count continues to pile up after the madness at Heaven’s Arena. Things are chaotic on the black whale even before it embarks but once it does, the pace picks up. Amid the chaos Kurapika finds himself in an increasingly untenable position – the royal guards (that name means something different than it used to in H x H) claim to have no knowledge of Nen. And the temporary “Hunters” claim no knowledge of the succession war about to unfold. Kurapika concludes that they were likely recruited by Pariston, and that their ignorance likely implies he didn’t know about it either – but I’m not totally convinced on that score. There’s an air of conspiracy to this whole affair (that’s almost a given with Togashi) and my sense is that Kurapika has no real idea yet just how deep he’s buried in the muck. Kurapika is, as usual of late, the smartest and most calculating guy in the room. But how far can that take him when his allies are so wildly outnumbered by enemies and potential enemies? The madness among the princes has already begun, with the First Prince and a prince named Kachou making their moves, and several guards have turned up dead, their bodies drained of blood. 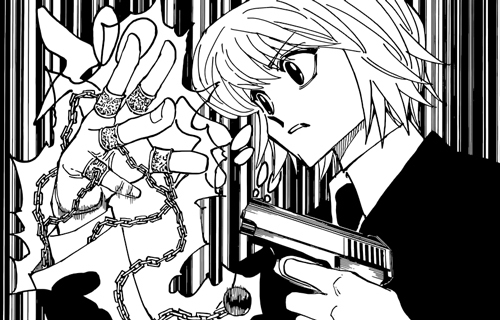 Kurapika turns to his chains for support, trying to get to the bottom of what’s really going on here – but as of right now he’s playing defense at the very least (and neither the Spiders or Hisoka have revealed themselves yet, if indeed they’re already on-bard). Strap in, because this is going to be a rough ride. That’s not a ship. That’s a powder keg on a one way trip to hell, and the fuse was just lit. I’d guess a ride on the Titanic would be far safer as at least 1 among 3 survived (with a higher chance for children, women, and rich ones). I wonder how much Kurapika has improved since York shin. I have a gut feeling he has new chain abilities on his other hand that he’s keeping secret from those who may already know about his hatsu. Does HunterxHunter always move so fast and is so packed full of information like this on every chapter? I’ve only just started reading the manga from where the anime left off when i finished the anime last month..and its just been mind boggling how much transpires each chapter. No, but it does in stretches. Over 350+ chapters there have been long stretches nowhere near this packed with data and/or death, but when Togashi slips into this mode he tends to stay there for some time. Chimera Ant is a perfect example of an arc that had stretches like this, very deliberate and humorous stretches, and everything in-between.